I found my favorite pie crust recipe in Saveur magazine’s recipe for Sour Cherry Pie a few years back. Turns out, it’s a riff on “The Pie and Pastry Bible” by Rose Levy Beranbaum. So you start with butter. 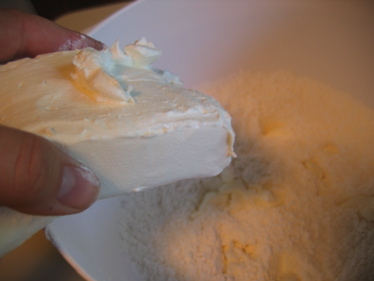 No matter what baking recipe you’re working with, you should always look to see what the deal is with the butter. Sometimes it needs to be room temperature, sometimes it needs to be very cold; either way, if you don’t start with butter, you’re in for a wait. For this recipe, the butter needs to be cold, so chop it up and put it back in the fridge. 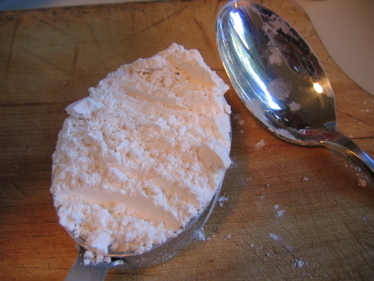 Add 1/4 teaspoon salt and 1/4 teaspoon baking powder and whisk everything together. Now you add the cream cheese. 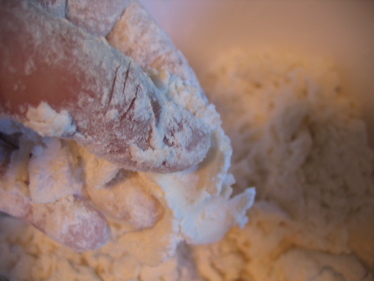 You can do this in the food processor, but I like to use my fingertips. 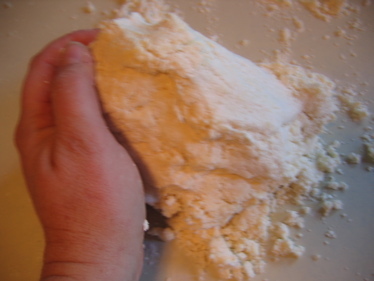 Just pick off a bit from the edge of the bar of cream cheese and mix it into the flour until it looks like coarse meal. 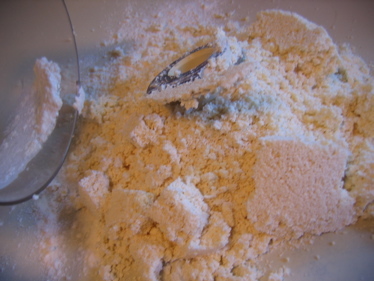 Take the food processor blade out, then grab the crumbs and press them together. Try not to touch the dough too much. Separate it into two halves, one slightly bigger than the other. Form those into disks. Cover with plastic wrap and freeze. When it’s time to make your pie, put the dough in the fridge the day before. 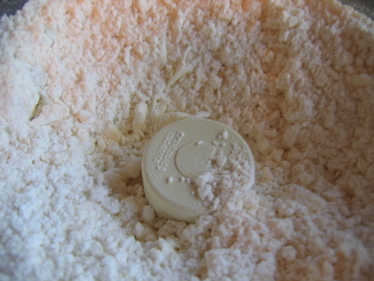 When you’re ready to roll it out, set it on the counter about five minutes, then roll from the center out. 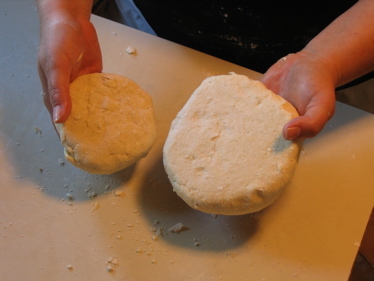 Turn a quarter turn and roll from the center out, until you’re at the width your pie recipe calls for. I’d definitely give this one an egg wash: it doesn’t brown as much as some of the others. This recipe will work great for fruit pies, but it’s versatile: and you can use it for any pie: Pumpkin, pecan or otherwise. great visuals and explanation liz! 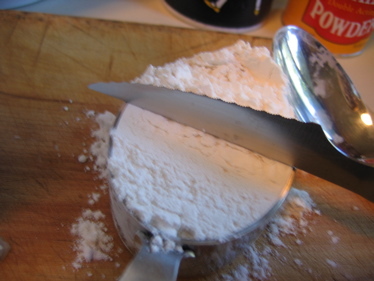 quick question — why cake flour vs. regular flour? can’t wait to try this recipe in my apple pie marathon. each year my husband & I go to Salingers and get tons of apples and make about 10 apple pies to have for thanksgiving and the holidays. we end up freezing some to pull out if we need last-minute treats to bring to holiday parties and neighborhood open houses. 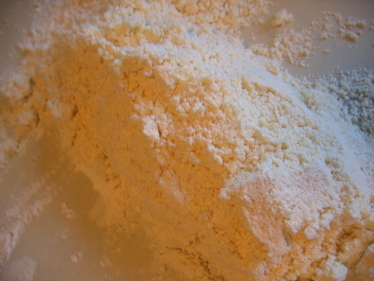 The recipe actually calls for pastry flour, but I use cake flour because it’s easier to find. The difference is the level of gluten. Gluten is what holds bread or pastry together, so the less of it you have, the flakier Ã¢â‚¬â€ or less held together Ã¢â‚¬â€ your crust will be. 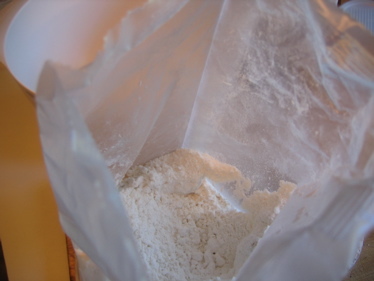 Cake flour has the least, pastry flour has more, and all-purpose flour has a little more. 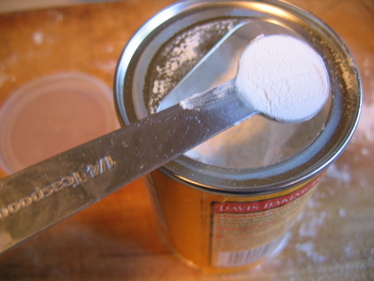 Gluten is kind of like chewing gum. You know how the longer you chew, the harder it gets? 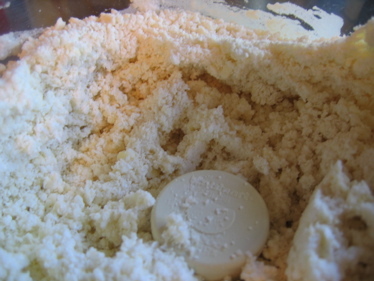 The more you knead dough, the more the gluten develops and the toughter the dough gets. That’s why you don’t want to handle pie dough too much. 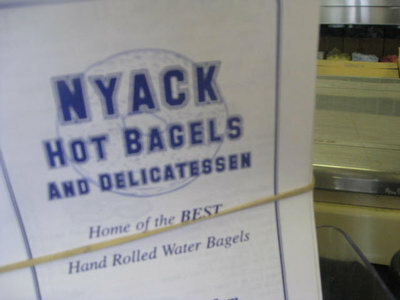 Think of the difference between a bagel (high gluten and chewy) and a pie crust (low gluten and flaky). This crust is going to go GREAT with apples. I hope you like it. Ah…thanks Liz. I was about to ask where the full recipe was, but I see you’ve included it. Interesting on the cream cheese addition. 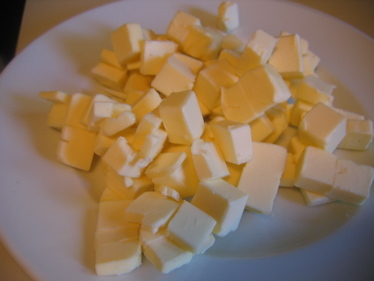 I have recently discovered the wonders of lard (I have been baking pies for 41 years) added to butter. So I would halve the butter and add lard. I’ve also never used baking powder in my pie crusts, so this will be a new one for me. 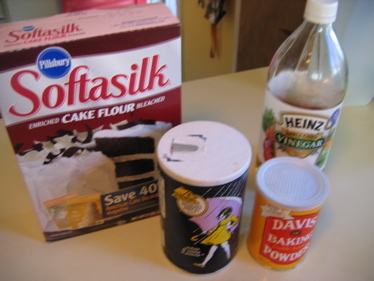 Ditto on the cake flour vs all purpose. 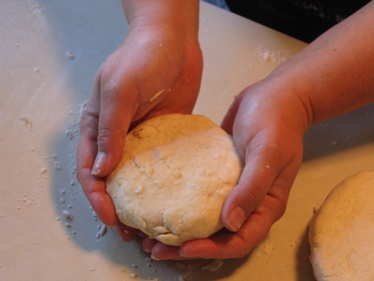 But you are correct on the handling of the dough. 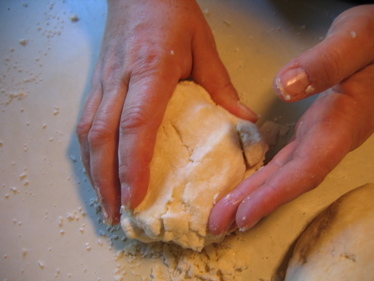 Make believe it is hot to the touch when you make pie dough, i.e., always use your hands in mixing it and touch it only enough to incorporate all the ingredients. Then, let it rest a bit in the refrig, let it warm to room temperature, and voila a crust better than anything you can buy in a bakery. 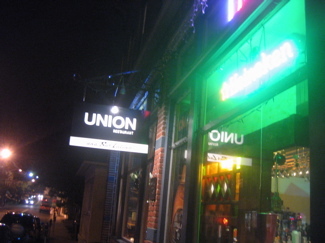 Any bakery. I promise you. That is a great suggestion about making believe it’s too hot! Thank you for sharing it. I did it!!! I made the pie crusts twice….and they have worked out wonderfully. Thanks for giving me the encouragement,inspiration, recipe, and pictures necessary to be a successful pie crust maker. My family also says a great big THANKS!!! !